Meet Senior Connect™ | Full Circle Home Care Inc.
Get to know SENIOR CONNECT™. SENIOR CONNECT™ monitors and communicates changes in your loved one’s behavior and condition to ensure that they are safe and healthy. It focuses on the client’s condition and takes family members’ concerns into consideration. As well as monitoring the client, SENIOR CONNECT™ is a 24/7, easy-to-use, customized reporting technology. 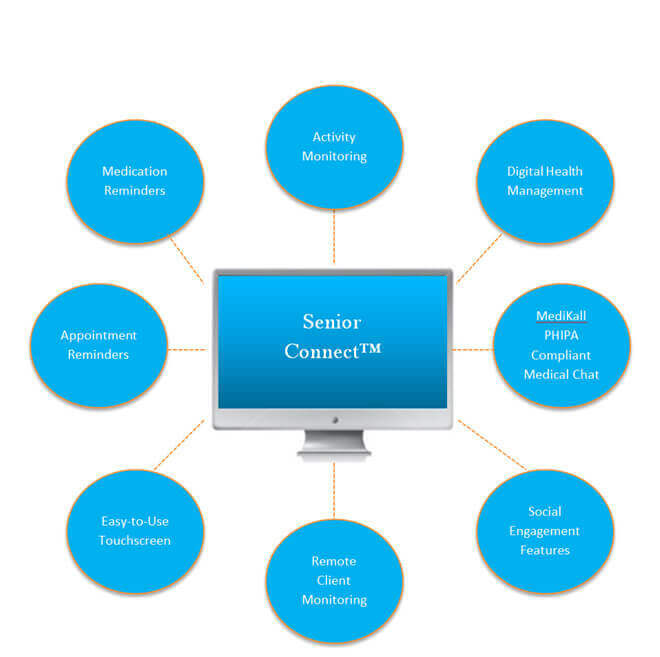 SENIOR CONNECT™ facilitates individualized communications covering medications, medical devices and physician care. It has the ability to oversee the client’s medicines, vitals, past medical history, glucose levels, blood pressure, appointments and any other information that is necessary to the client. SENIOR CONNECT™ establishes a baseline and recognizes changes in behavior so it can customize alerts based on the individual and the family members’ preferences. This transparent communication gives the client’s care team the knowledge to book a check-up, review medication and treatment based on SENIOR CONNECT™‘s data. SENIOR CONNECT™ proactively assists in real time, creating accountability and ensuring that optimal options are properly implemented. The ultimate goal is to make life a little less stressful for both the client and the family member. It connects individuals with their family members and care team, sending them alerts and messages to keep in touch. However, SENIOR CONNECT™ is not all business. Completely customizable, SENIOR CONNECT™ can even play your favorite music. Through this PHIPA compliant system you are able to share photos, letters, connect via social media, and engage in Skype video chats with family members or caregivers at any time. SENIOR CONNECT™ can create custom memory games, connect the client to their favorite healthy recipe or even show them the latest YouTube video. If the client’s family member is in another province or Country, they can feel as if they are right there with their loved one. Contact the Full Circle Home Care team today for an online demo of the technology and to learn more about SENIOR CONNECT™. Whether you’re just exploring your options or need home care assistance right away, contact a member of our expert home care team today to learn more about Senior Connect™.